Seedling survival and successful forest restoration involves many silvicultural practices. One important aspect of a successful forest restoration program is planting quality seedlings with high survival capability. Thus the nursery needs to create seedlings with plant attributes that allow for the best chance of success once a seedling is field planted. Since the mid-twentieth century, research foresters have critically examined plant attributes that confer improved seedling survival to field site conditions. This review describes the value of commonly measured seedling quality material (i.e. shoot height, stem diameter, root mass, shoot to root ratio, drought resistance, mineral nutrient status) and performance (i.e. freezing tolerance and root growth) plant attributes defined as important in answering the question of why seedlings survive after planting. 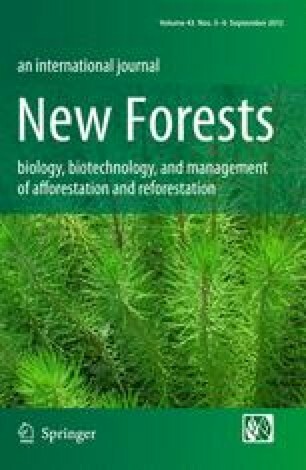 Desirable levels of these plant attributes can increase the speed with which seedlings overcome planting stress, become ‘coupled’ to the forest restoration site, thereby ensuring successful seedling establishment. Although planting seedlings with these desirable plant attributes does not guarantee high survival rates; planting seedlings with desirable plant attributes increases chances for survival after field planting. I thank Dr. Steve Colombo for the wide ranging discussions that lead to the initial structure and focus of this paper. I also thank Drs. John Mexal and Dave South, and the Editor-in-Chief and three anonymous reviewers whose review of draft versions of this manuscript kept me on topic and within context of the published literature.